A new piece of Star Wars: Episode VII concept art appears to show the Millennium Falcon in all of its glory. J.J. Abrams is a notoriously secretive director, so the fact that we know very little about Star Wars: Episode VII isn't exactly surprising. However, a strange piece of information may have accidentally slid out of Abrams' clutches via LucasFilm's recently redesigned website. The website, which had remained relatively untouched since Disney took over in 2012, now includes a photo of the Star Wars production team during a staff meeting. 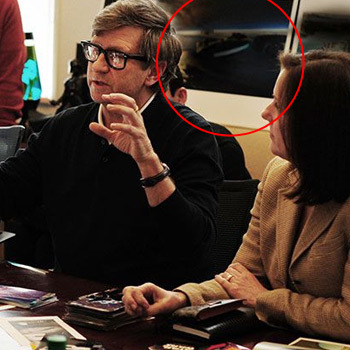 LucasFilm's president Kathleen Kennedy, Sr. VP of technology Kim Libreri, and production designer Rick Carter are all visible, along with the back of J.J. Abrams' head. However, the most interesting part of the photo is the wall of concept art that's hanging in the background. None of the photos are clearly visible, but one appears to be a shot of the Millennium Falcon descending onto a planet. An appearance from the Millennium Falcon wouldn't shock anyone. We already know that Harrison Ford will be reprising his role as Han Solo, and the Falcon is Solo's preferred method of travel. However, I would also like to point out that none of this is official. Neither Disney nor LucasFilm has made any kind of announcement regarding the plot, and I could probably think of a dozen perfectly good reasons for this piece of art to exist.